Over the last 6 weekend Larne Swimming Club athletes have competed in 6 open meets, 1 schools meet, 1 club meet and 1 club time trial. What better way to prepare for Christmas than with Ulster Championships? A team of 21 swimmers competed for the club over the 3 days of racing in Bangor Aurora. The 400 IM next and Lui Hurson knocked over 10 seconds off his best to just miss out on the final. He did however make up for this disappointment in the 100 medley qualifying into 2 nights final in 2nd place with another great personal best. The womens 100 breast was a little hit and miss with 3 PBs out of 5 swims. Most notably Mairead O’Mahony knocling over 4 seconds off her time. While in the men’s event Jan staked his claim for a relay place with a solid swim. The men’s 50 Fly provided no shocks as new Irish Record holder dominated the heats setting up for hop0yefully anther cracking at his own record later with Ryan Lewis making it 2 Larne athletes through to the final. ZJ then lowered her time by 1.5 seconds in the same event making 2 PBs from 2 swims for bambi after the 100IM. The 800 Free and all 4 girls swam impressive best time Amy Campbell and Erin Barr both lowering their times by over 13 seconds. Ryan and Jan brought the morning session to a close with 2 more best times in the 100 IM, Ryan joining Lui into the final session 2 night. The Finals session on day 1 got underway with the 100 FS and Danielle continued her improvement in this event taking her time down by over a second to 55.81 picking up a silver medal. Conor Brines continued his dominance of the sprint fly event with another Gold making him the Ulster, Irish & Scottish open championships. He also lowered the Irish senior Record by 0.05 to stand alone as the fastest Irish flyer. Also in this final was Ryan Lewis who, having posted a best time in the heats, showed that given an evening swim he can go faster again. Something he backed up in his 2nd final of the night the 100 IM. 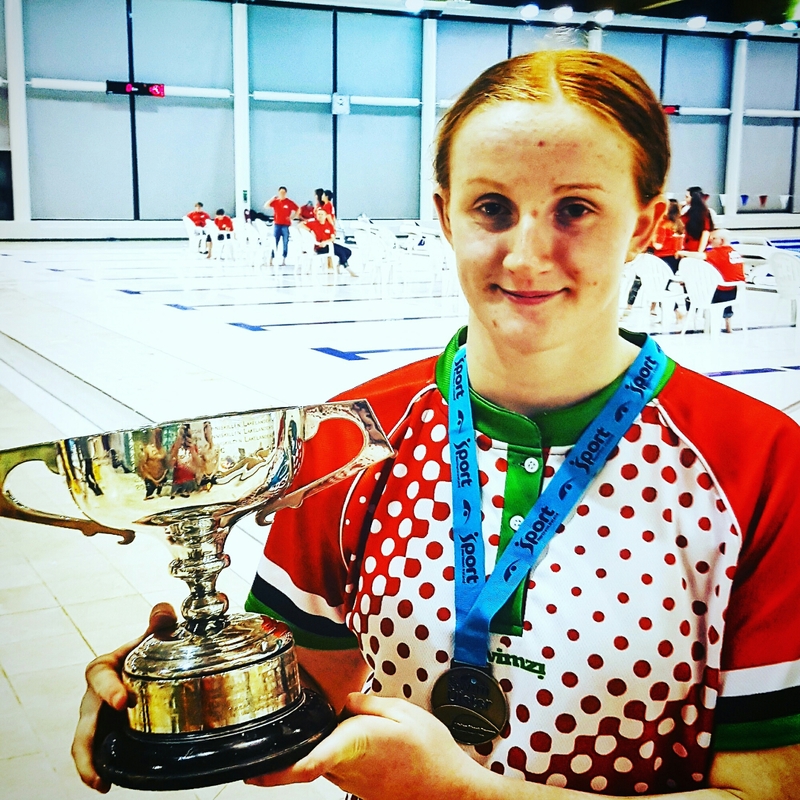 It wasn’t long before Danielle was back in the pool in what some consider her best stroke, the backstroke, and again she swam to a lifetime best lowering the time she set at Irish Championships 2 weeks ago. The 2 relays brought the session to a close with a Bronze for the Girls and a 4th for the boys. A fantastic start to the weekend. The 2nd day of the Ulster Championships kicked off with the 200IM, and in her ‘fun event’ of the day Danielle qualified for the final, a feat she would match by qualifying fastest for bothe the 50FS and 100BC later in the session – a great mornings work. Mairead and Amy Campbell continued to improve both recording best times. 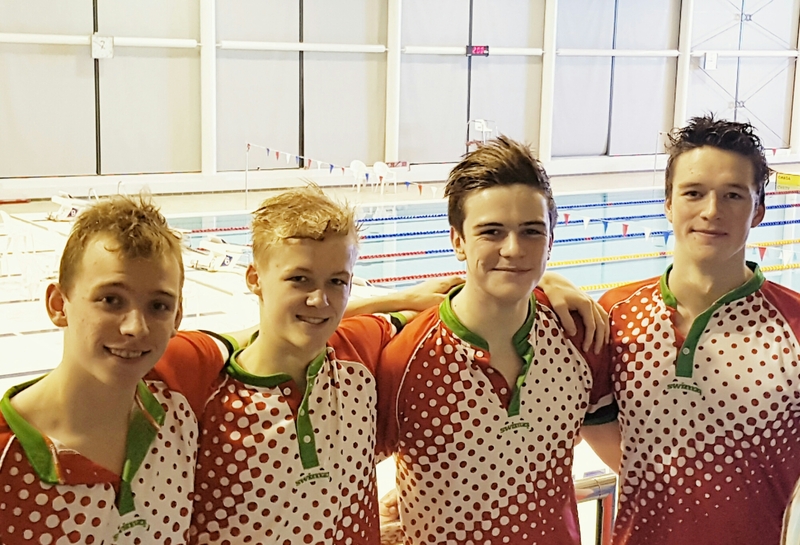 The 100 Free next and Lui & Finn picked up where they left off last weekend by continuing to improve on the times the set in Edinburgh and Qualify for the final in the process. Finn doubled up on his finals with a new best time in the 50BC as well. Jan, Adam and David all produced life time bests swims in the 200BrS while the girls had a mixed bag in the 50 with PBS from ZJ, Amy and Cher. ZJ getting in 2 a swim off for the evenings session but just missing out on a final place. Arguably the best swim of the morning belonged to Conor Brines in the 100FLY recording another Irish senior Record to easily qualify fastest for the final. PBs for Ryan and Lui saw them just miss out on evening swims in the same event. The 100 BC and joining Danielle in the heats was Mairead who finished off her day withe a solid race in the fastest heat. The last swim of the morning belonged to Amy Barr in the 400FS, having PB’d in this event 2 weeks ago Amy swam to within 1/2 a second of her best. A record stans for 13 years them falls twice in a week!! Danielle got the finals session off to an incredible start with another Irish Senior Record in the 50FS winning her 1st Title of the night. She later backed it up with another PB in the 100BC to bring her titles count to 3 so far. Finn and Lui continued their development into real competitors at this level with their 3rd final each of the weekend in the 100FS Finn stopping the watch under 54 for the 1st time. In the very next race Finn is back again with the 50BC again posting the 2nd best time he has ever swum. 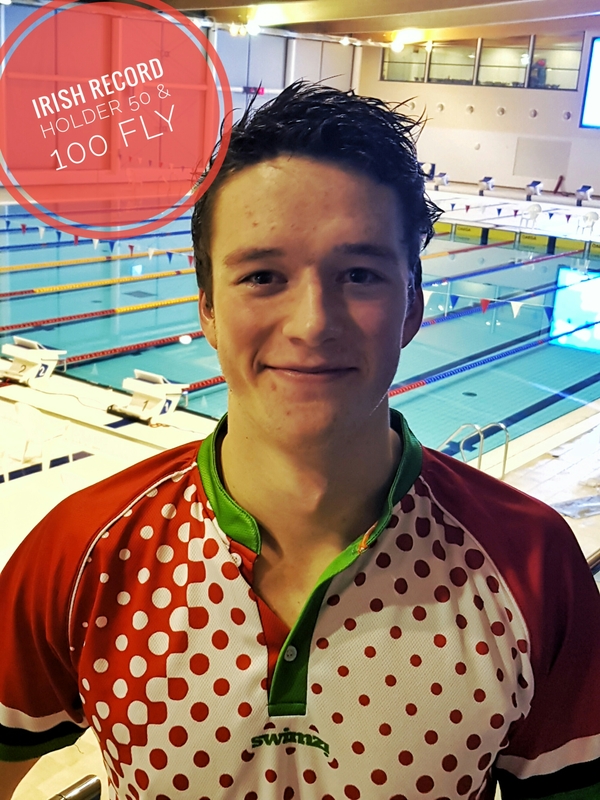 Conor Brines continues his incredible rise to the top of Irish swimming with a 52.08 Irish senior Record in the 100FLY. The last race of the night, the Mixed Medley FTR saw the team of Finn, Danielle, Chloe and Conor double the silver medal count. The last day of racing and the Men’s 200IM is up 1st with Ryan and Adam swimming lifetime bests, both boys would rep eat this feat in the 200 FLY later in the session. Ryan continues to improve with 2 more finals meaning he has finaled in very event he has entered. The womens 50 BC and once again Danielle was to the for posting a time 0.01 outside her own Ulster Senior Record qualifying for the final in both this and the 200FS. Some of the younger girls stepped up to produce huge best times in the 200BrS especially Mairead and Giullia who each knocked over 10 seconds off. Lui finished in a creditable 6th in the 400FS and finished the morning off with a PB in the 50 FS to make the final in this, a fun event for him. 1 more session 2 go and this run of 9 meets in 6 weekend will be over. The last session of the meets kicks off with Ryan in the 200IM, having qualified for every final and swum faster in every one Ryan continued this trend with a new lifetime best in the medley. 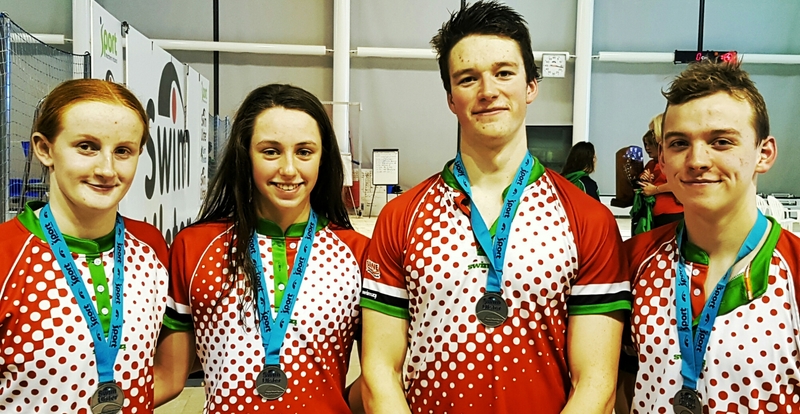 Danielle Hill proved again just how fast she can be with a new Ulster Senior Record in the 50BC taking the Ulster Title in the process. Erin Barr, making her 1st appearance in the finals session, up next in 200BRS clocking her 1st PB in a year #HWAPO well done Erin. Ryan completed a personal full house competing the final of the 200 FLY and stopping clock in another new PB. Danielle Hill in the 200FS took her 5th title of the meet with yet another personal best time bring a phenomenally good meet to a close. The relays bring the curtain down on the meet with the men’s 4 x 200 of Lui, Finn, Ryan and Conor taking the bronze. Not to be outdone the womens 4 x 100 medley team of Danielle, Erin, Zara & Chloe hit the wall in 3rd place.